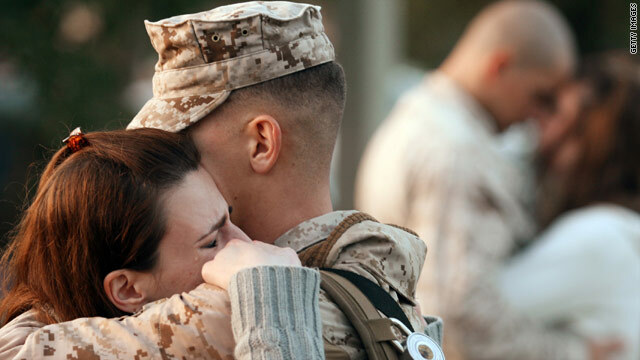 Marine Corporal Adam Marano hugs his wife Melissa Marano on November 3 at Camp Lejeune, North Carolina. Mullen: We could not be the military "we are without extraordinary family support"
(CNN) -- "You don't do it alone," Adm. Mike Mullen, Chairman of the Joint Chiefs of Staff, said Monday to a crowd gathered at Camp Lejeune, North Carolina. "You do it with phenomenal family support. And we could not be the Marine Corps we are, the military we are without extraordinary family support." Mullen's pep talk -- along with a question and answer session -- was geared to the new 30,000-troop surge to Afghanistan that President Obama laid out last week. He also thanked those in the audience -- many of whom will soon be deployed to Afghanistan. "I am and will be eternally grateful for your service to our country at this very, very critical time," he said. "Everybody makes a difference. This is taking care of each other. This is taking care of all the responsibilities both here for our families as well as moving forward." Military families struggle when their loved ones are serving in the war theater -- both economically and emotionally. Teresa Meador offered advice to other Marine wives on what to expect. "My one piece of advice, and I was given this advice by a Marine wife: 'It [war] makes a weak marriage weaker, and a strong marriage stronger,' " Meador said. "And that's very true. You can take it and run with it, or it can break you down. And it's up to you." Her husband, Marine Capt. Eric Meador, said it's often hard for people outside the military community to understand what families have to go through. Video: Clear message on Afghanistan? "I don't think when you have X number of deployments under your belt that it makes it any easier -- you just know what to expect," he said. "You know what to expect next time as far as how you need to manage things -- the stateside of things." According to Department of Defense statistics through September, 83,259 Marines have been deployed more than once; 300,789 soldiers (active duty, National Guard and Army Reserve) have been deployed more than once. But will the 30,000-troop surge stretch deployments even further? No, according to top Army brass. In a message to senior Army leaders on December 2, Army Secretary John McHugh and Chief of Staff Gen. George Casey, said the 30,000-troop surge will not affect deployment length, dwell time or the end of stop-loss, according to the Army News Service. The message indicates that because of the growth of the Army over the past five years and the drawdown in Iraq, the Army is able to tackle the troop increase without going to 15-month deployments; going to less than 12 months at home between deployments; Halting the plan to come off stop-loss -- where a service member's tour is involuntarily extended in an effort to retain them. Brig. Gen. Jeff Mathis -- the acting commander of Fort Lewis in Washington state -- said troops will continue to feel the stress. "So are we going to continue to see stress? If we continue these deployments, will there be stress on the force? Absolutely," he told CNN's John King. Mathis, who meets with families regularly, said there are consultants that work with families "trying to do everything we can to ensure we are alleviating that stress in every way." He admits that he'd like to see longer stretches at home in between deployments, but ultimately, the military is going to do what "our nation asks us to do." Soldiers stationed at Fort Bragg, North Carolina, meanwhile, know all too well about the tough strain of deployments. Obama's decision directly affects those at Fort Bragg, some of who will soon depart for the mission to Afghanistan. But the president gave families something they haven't seen before: a timetable. In announcing the surge of 30,000 more troops to Afghanistan, Obama said he intended "to begin the transfer of our forces out of Afghanistan in July of 2011" in a responsible transition that considers "conditions on the ground." For Maribelle Meno, a Fort Bragg spouse, those words were "reassuring to hear." "It's been hard as a military spouse, having to hear deadlines but it's never fulfilled. ... In this case, he [Obama] gave a strong background for his need to have a deadline."